T.Y.E. is an acronym standing for "Through Your Eyes." Our commercial studio and collection of photographic artists is based in beautiful Fort Lauderdale, Florida. 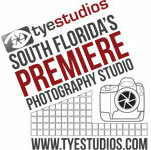 Designed from the ground up by professional photographers, T.Y.E. Studios is a complete photography services solution for the creative industry, serving South Florida for 10 years. Originally located in Port 95 Commerce Park, and relocated to Griffin Road in 2016. Our photography services include portraiture and commercial productions. The photographers at T.Y.E. Studios provide artistic images and a one-of-kind experience in-house. From the moment you walk into our studio, you are greeted by one of our commissioned artists and guided through the process of creating your desired look. We offer vision, inspiration, and creativity to all our valued clients. Our studio rental service is perfect for both the local or destination professional who needs a professional controlled environment with air conditioning, dressing room, makeup space. Our studio includes a basic professional Profoto lighting packages with each rental, additional modifiers or equipment is right here in-house. We are a boutique studio rental facility in the heart of Miami's midtown, tailored to the advertising, editorial and digital industries, offering a creative space for photography, web video and corporate productions. The Lens Depot is your source for Cameras, Lenses, Lighting, Video Equipment, Support, and Drone rentals. We offer local pick-up in Orlando and Tampa, as well as shipping all across the United States.